Firm Description The Salazar Law Firm, PLLC, is a Houston-based firm that helps individuals throughout the state of Texas. We fight for people who have been injured by the carelessness of another person or a company. Our firm has vast experience in handling matters involving serious or fatal injuries resulting from: * Auto Accidents & Insurance Claims * Motorcycle Accidents * 18-Wheeler Accidents * Recreational Vehicle Accidents * Bus Accidents * Product Recalls * Plant Explosions * Wrongful Death * Product Liability * Work Accidents * Defective Products * Harmful Drugs * Catastrophic Injury If you or your loved ones have been injured by another's negligence, The Salazar Law Firm can help you understand your rights under Texas law. Our legal team is dedicated to assisting clients with the physical and financial recovery process which often accompanies bodily injury, including: *Ambulance Bills *Hospital Bills *Prescriptions *Physical Therapy *Chiropractic Therapy *Psychiatric Care *Rehabilitative Care *Funeral Expenses Case Evaluation Tell us about your situation and we'll give you an unbiased evaluation. We do not collect any fees unless we win your case! It is our goal to maximize our clients' recovery and deliver favorable results in a reasonable amount of time. Swift Resolution Our firm is guided by strict guidelines and standards of performance. We aim to maximize our clients' recovery while delivering results in a reasonable amount of time. The Salazar Law Firm is a Houston based firm that excels in personal injury law, including Auto Accidents & Insurance Claims, 18-Wheeler Accidents, Motorcycle Accidents, Catastrophic Injury, Product Liability, Class Actions, and Wrongful Death. The Salazar Law Firm, PLLC, is a Houston - based law firm offering an array of services to both individuals and businesses. Our focus is on education and total satisfaction achieved through constant communication and careful attention to each clients individual goals. We excel in many areas of personal injury law, including Auto Accidents & Insurance Claims, 18-Wheeler Accidents, Motorcycle Accidents, Catastrophic Injury, Product Liability, Class Actions, and Wrongful Death. Our practice is guided by strict guidelines and standards of performance. We aim to maximize our clients recovery while delivering results in a reasonable amount of time. We are motivated by more than just the bottom line. Building our relationship with you is goal number one. We don't just want you to come to us when you have a problem. We want to have a dialogue with you. Free of charge. Tell us about your situation or ask us anything by phone or from anywhere on our website. We'll give you an unbiased evaluation. Our ultimate goal as a firm is to deliver quality service efficiently and responsibly. Each case is handled by each member of our team at various stages. This process ensures that every case is well known by the entire staff and handled properly from beginning to end. We pride ourselves on being available for our clients at all times. Whether in returning a phone call promptly to communicating with clients after hours, our staff is here to accommodate to you and your needs. Our diverse office staff allows us the flexibility to communicate with clients in English, Spanish, and Vietnamese. We proudly represent clients throughout the great state of Texas. Moreover, our team of attorneys provides personal attention to each and every client regardless of their location. Our experience coupled with our resources and technology allows us to handle a wide array of cases. Whether your personal injury case is simple or highly complex, our team is designed to produce excellent work and results for you. Many individuals are unaware of their rights when it comes to the law. 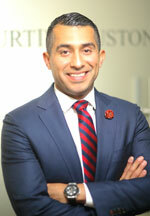 David Salazar is the sole founding member of The Salazar Law Firm. His practice focuses primarily on catastrophic personal injury matters. David is a fifth-generation Texan who was born and raised in San Marcos, Texas. David obtained a Bachelor of Arts in Political Science with a double minor in History and Religion from Texas State University. While attending law school, David worked as an insurance adjuster for a large insurance company as well as a private investigator; both granting him valuable insight and laying the foundation for his successful career. After graduating from The Thurgood Marshall School of Law, David opened his practice in Houston and quickly gained recognition as a formidable Plaintiff's attorney. The Salazar Law Firm is located in the historical Heights area of Houston, Texas. David has successfully represented thousands of individuals who have suffered serious personal injuries caused by the negligence of others.